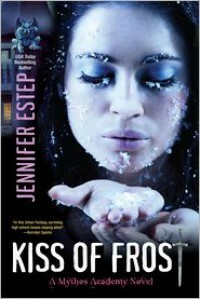 Once again I enjoyed myself thoroughly in the world that Jennifer Estep has build. With all the references to mythological creatures, all the myths that she has integrated in the story and the “history” that Jennifer Estep created it was a great place to be. There was only one thing that put a damper on my bliss: Gwen and the way she acted. What happened to the sensible girl I met in the first book? That girl who knew that sometimes you just can’t do things alone, so it’s wise to call for back-up? That girl who knew when things were getting out of hand? Who knew that she, with only a couple of months of training, could not possibly stop a Reaper. What exactly happened to that girl? At any rate, I did not encounter her in this book. Enough about Gwen, lets focus on the things I did like. Like Vic, the talking sword. He’s just too funny with his remarks and bloodthirstiness. Ever hero should have a sidekick with a great sence of humor ^^ I started smiling as soon as he opened his mouth. And I never thought it would be this fun, hearing someone talk about killing persons and tasting their blood. I know this sounds a bit weird, but Vic made it fun and laughable ^^I also liked how we slowly unravel the mystery that is Logan Quinn. There’s some hinting at a dark past and I can’t wait to delve into it. And of course I loved every moment when he once again arrived to save the day ^^ Even though I normally hate the damsel in distress, Logan made it worthwhile. There’s still one thing that bothered me. That’s probably because I’m reading A Kiss of Frost within a day after finishing A Touch of Frost. The explanations of who, where and what were a bit too elaborate. It totally broke the flow of the story, especially at the beginning. Since all that happened in A Touch of Frost was still fresh in m memory, I didn’t want to dwell on it. I wanted to continue where we left, to find out more.